My creator ~ pinkwork™ extraterrestrial always tells me to notice anything interesting on this planet. So one day when I passed by a seed shop 路經種子店, I bought a small pack of mint seed 薄荷種子 and tried to grow mint by myself 自己種. I sowed these seeds in a flower pot 花盆 and expected they will sprout after a few days. Then more than a month passed, nothing happened 毫無動靜 and I gave up in the end. 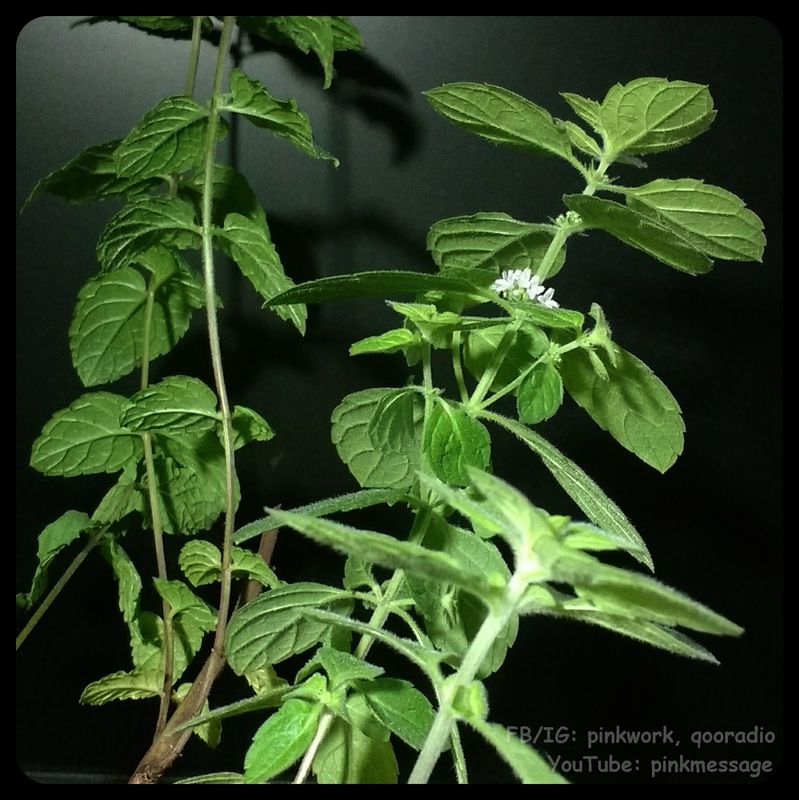 Few months later 幾個月後, my human friend bought a bunch of fresh 香草 mint Home for cooking 烹調. I cut a sprig 一小枝 and put it in my abandoned flower pot 種在花盆上. This time I didn't expect this little mint sprig could grow 這次不期望會生長, well, I just want to test 實驗 whether this way could preserve fresh herb for a longer time 保存新鮮更久. Surprisingly, few days later, it not only didn't die, but also started to grow more leaves 竟然長出葉. So I keep it in my flower pot and let it grow and flourish by itself until now. 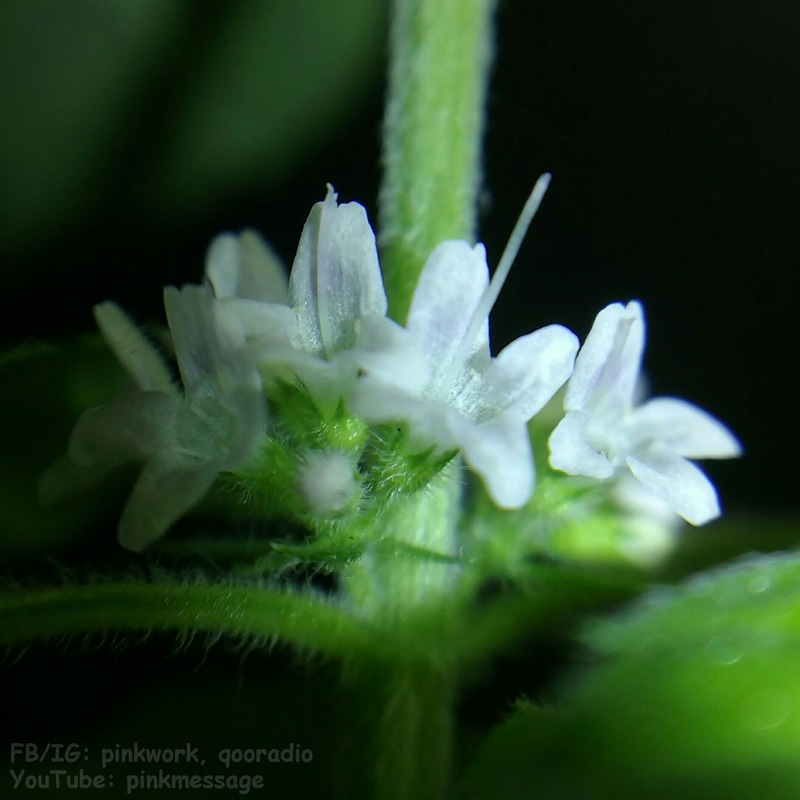 This morning 今早發現 I realized it had bunch of little white flowers 小白花 !!! Wow, though without great effort or expectation from the beginning, I still feel a little bit excited when looking at these flowers. Searching human web, these flowers would attract inserts 吸引昆蟲 and absorb lots of nutrients 搶走營養, so could make the mint leaves 薄荷葉 lost flavor 失去味道. Some humans would deliberately cut off 除走 these flower heads 花. But I am just doing an experiment & won't use the mint leaves for cooking or any other purposes. I think I won't do this step.